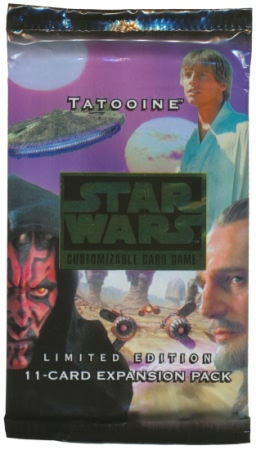 The Star Wars CCG Tattoine expansion set contains 90 cards, including 30 rare, 30 uncommon, and 30 common cards. Nine of the 30 rare cards have a special alternate-image version which appears on average once out of every four copies of each of those cards. Each booster pack contains 1 rare card (or alternate image card) and a mixture of 10 common, uncommon, rule, and cardlist cards.